That becomes all too clear when the colder weather moves in, leaving some with nowhere to warm-up. The Isabella County Restoration House Day Shelter is a mobile shelter for those in need, partnering with more than two dozen churches. They opened their doors Sunday. 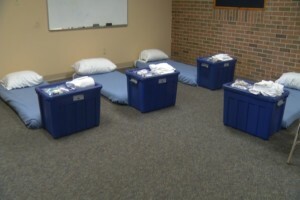 The Isabella County Day Shelter is now open and it’s doing great things for the homeless in the community. “We are only open for the cold months, and are looking to definitely keep all the folks in need of shelter safe and warm and would love to connect them with all of the resources that they need so that they can break their cycle of homelessness and transition into self-sufficiency,” Ryan Griffus, Isabella County Restoration House said. It’s been a work in progress for the Isabella Restoration House, working long and hard to open the doors before the cold weather moves in and beats them to it. “This is just so great, especially today. It’s opening today and it’s cold and it is raining, and it’s so great to have people here,” Angelina Maney, chair, day shelter committee said. Maney explains the peace of mind their services bring. “It’s huge here and to have this up and running, have somewhere where people can stay warm, not just an night, they can stay warm the entire day, we know we are only open a couple of hours, but they come right from the soup kitchen,” Maney said. From 4:30 to 6, seven days a week, the building is open and ensuring no one is left out in the cold.